Anhay Cottage is a beautifully refurbished cottage on a working farm just a stone's throw from the coast at Gunwalloe, Cornwall. Miles of walking are available in every direction and the South West Coastal path is easily accessible within half a mile. Just a few fields away is the local pub, Halzephron Inn. The pretty fishing cove at Gunwalloe with its pebbly beach is just five minutes walk and the sandy beach (with lifeguards in the summer) at Church Cove is just a mile down the road. The cove gets its name from the historic church built practically on the sand and dating back as early as the 13th Century. A walk through the National Trust's Penrose estate will take you around Loe Pool, the largest freshwater lake in Cornwall, and on to Loe beach and the fishing town of Porthleven. Now getting a name for its fantastic restaurants and fresh seafood as well as its pretty working harbour. Rick Stein is one of the latest to open a restaurant there. A short car journey will take you to any of the traditional fishing coves on the Lizard Peninsula, an area of Outstanding Natural Beauty and Special Scientific Interest due to the large variety of Flora and Fauna that abound there. 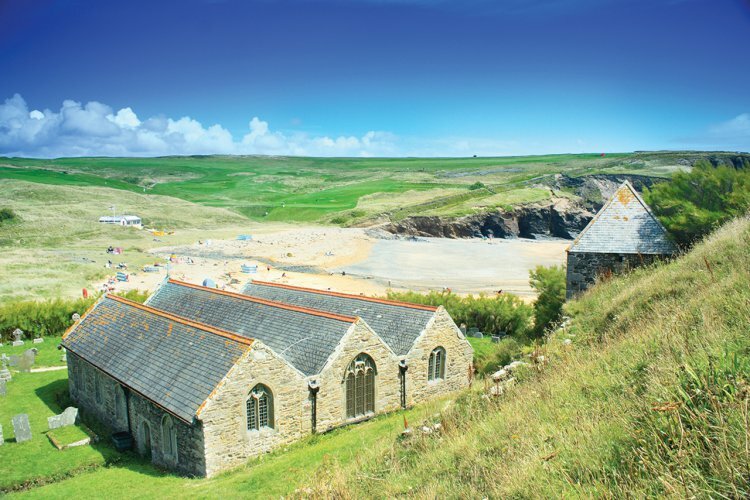 From hidden coves and cliff top walks to fish and chips - the Lizard has it all. Nearby attractions include Flambards theme park and Gweek Seal Sanctuary, both just 10 minutes away while further a field Penzance, Lands End, St Ives and Truro all offer a great day out. Anhay farm is a working dairy farm and you are welcome to watch (and help!) feed the calves if you want to. The cottage enjoys a private position with a lovely sheltered patio as well as a conservatory with dining table and chairs. The comfortable lounge has reclining chairs, a large flatscreen LCD TV with freeview, DVD player and WiFi. The well-equipped kitchen has an electric oven, 4-ring hob with extractor over, microwave and a dishwasher. Bedroom one is a large double with a 5' king-size bed, bedside tables and lamps and an oak wardrobe. Bedroom two is normally a single room but can easily be made into a twin with 3' single beds with bedside table and oak wardrobe. The family shower room has a large shower cubicle with electric shower over, matching toilet and handbasin with mirror over. Outside is a sheltered patio area with garden furniture and parking for up to two cars. The property benefits from a shared Laundry room with Anhay Stable with a washing machine available and airer. Enter through the sun room/dining room. Connected to livng room with 3 seat recliner sofa, arm chair, LCD TV & DVD. Kitchen with electric oven, 4-ring hob, extractor, microwave and a dishwasher. Bedroom one with king-size bed and an oak wardrobe. Bedroom two with single bed, can be made into twin single beds, and oak wardrobe. Family shower room with large shower cubicle, electric shower, toilet & hand basin. Anhay Cottage is part of the Anhay Farm family of cottages, the other cottages are displayed below.